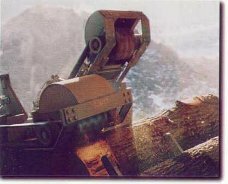 HMC is pleased to offer a full range of sawmill equipment. HMC is a pioneer in the development of Rosserhead Debarkers. Four models are available to suit most production environments with log diameter ranges 6 - 36", 7 - 42", 8 - 48", 10 - 54", and other sizes, depending upon the customer's requirements. These high-quality units feature a slant track design to eliminate log hangup and variable speed hydraulic controls for smooth and responsive log rotation and carriage control. See one in action on Youtube. HMC's core products include Debarkers, Carriages, Carriage Drives, Trimmers, Waste Conveyors, Lumber Handling Equipment, Infeed and Outfeed to Band Resaws, Chain Turners, Metal Detectors, Tilt Hoists, and Band Mills. We also have some Used/Rebuilt Products and other lumber products for sale. HMC's core products include Debarkers, Carriages, Trimmers, Waste Conveyors, Lumber Handling Equipment, Infeed and Outfeed to Band Resaws, Chain Turners, Metal Detectors, Tilt Hoists, and Band Mills. We also offer layout, design, and installation as well as parts and service. HMC has formed a strategic alliance with Stenner Limited to complement the product line. Stenner Limited manufactures Band Resaws and Resaw accessories.